A young Benjamin Franklin wrote this little verse in 1728 to serve as his epitaph. Franklin made copies of this verse for friends at various times in his life. 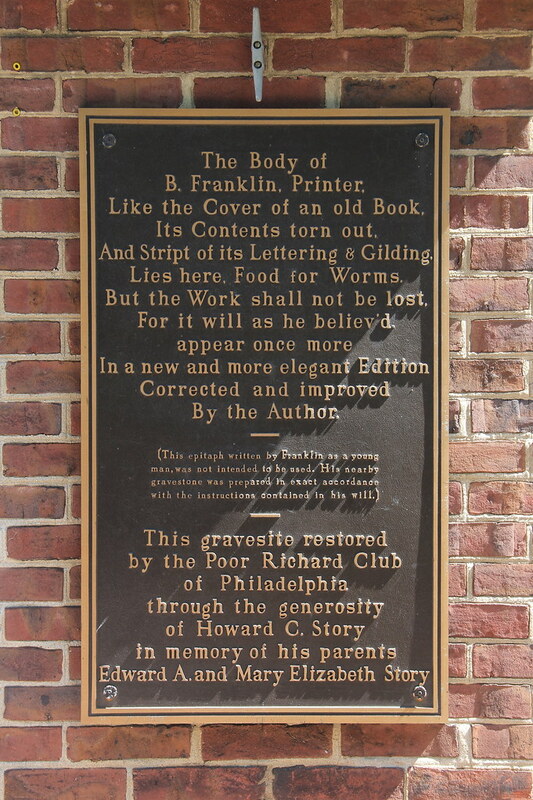 This plaque appears on a wall near Franklin’s grave. “Good morning, and how is John Quincy Adams today?” asked an old friend as he shook the former president’s trembling hand. It was not long after that he suffered his second and fatal stroke. 2 Corinthians 5:1-9 (Contemporary English Version) — Our bodies are like tents that we live in here on earth. But when these tents are destroyed, we know that God will give each of us a place to live. These homes will not be buildings that someone has made, but they are in heaven and will last forever. While we are here on earth, we sigh because we want to live in that heavenly home. We want to put it on like clothes and not be naked. These tents we now live in are like a heavy burden, and we groan. But we don’t do this just because we want to leave these bodies that will die. It is because we want to change them for bodies that will never die. God is the one who makes all of this possible. He has given us his Spirit to make us certain that he will do it. So always be cheerful! As long as we are in these bodies, we are away from the Lord. But we live by faith, not by what we see. We should be cheerful, because we would rather leave these bodies and be at home with the Lord. But whether we are at home with the Lord or away from him, we still try our best to please him. Father in heaven, draw our hearts to you, that our hearts may be where our true treasure is found, and that our minds and thoughts may look to your kingdom, whose citizens we are. Thus, when you shall call us hence, our departure may not be a painful separation from this world, but a joyous meeting with you. Perhaps a long road still lies before us. Sometimes our strength is gone, and a faintness overcomes us, and we are in darkness; we become restless and impatient and our heart groans in anxiety about what is to come. O Lord our God, do then teach us, and strengthen in our hearts the conviction that in life, as well as in death, we belong to you. Amen. This entry was tagged heaven. Bookmark the permalink.